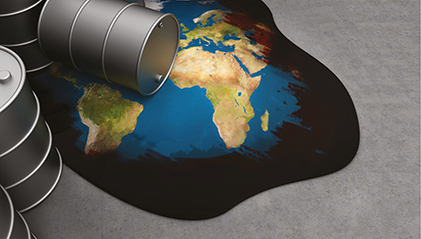 Crude oil remains a critical driver of the global economy, and fluctuations in the price of oil have a major effect on economic growth, development and welfare across the world. The ups and downs witnessed recently are reminiscent of the legendary Greek mythological figure Sisyphus who was tasked with rolling a heavy rock uphill only to see it roll down again as it neared the top. The global oil benchmark behaves in the same way. Recently, oil prices hovered around US$ 80 a barrel. With the combination of renewed US sanctions on Iran, potential sanctions on Venezuela, a rising geopolitical risk premium, strong demand and other factors, everyone is now talking about 100 dollar levels. Saudi Arabia is a modern-day Sisyphus and its rock is global oil inventories. Reducing inventories by increasing global demand or curbing production is how Saudi Arabia, as the head of OPEC, ensures the price of oil rises. The latest ‘rocks’ for Saudi Arabia are Iran and Russia, which are able to increase production at will and jeopardise its dream of a longer rally in oil prices. In the past, OPEC members themselves were responsible for the collapse of oil consumption due to the price shocks of 1973 and 1978, which collectively lifted the price of black gold from three dollars a barrel to US$ 32. Today, shale production is at its peak thanks to the long run of higher oil prices coupled with technological innovation. An investment research report characterises this dramatic change as creating ‘Saudi America.’ Supporting this view, the International Energy Agency (IEA) foresees that by 2020, the US would displace Saudi Arabia as the world’s largest oil producer. A problem of plenty haunts the Saudis. With the US becoming self-reliant and Canadian oil sands penetrating European markets, Saudi Arabia is left to compete with aggressive Russia and Iran for a larger share of the Asian oil market to sustain output. Furthermore, Saudi Arabia wants to succeed in selling shares in its national oil company Saudi Aramco through an IPO slated for next year. It has said that Saudi Aramco will be worth two billion dollars and the offer of five percent of its shares will raise US$ 100 billion for national coffers. Experts have advised Saudi Arabia that the price of oil must be in the 50 to 60 dollars a barrel range for the expected valuation to be achieved, which is yet another reason why Saudi Arabia continues to want to push prices up. Likewise, four of OPEC’s top five producers can meet government spending goals with the price of oil at around US$ 70 a barrel – with the exception of Saudi Arabia, which needs a price of 87 dollars a barrel to balance its budget, the IMF says. So what is good for the world – sky-high oil prices or stabilisation? Although OPEC’s principal objective is to “devise ways and means of ensuring stabilisation of prices in international oil markets, with a view to eliminating harmful and unnecessary fluctuations,” there’s more to it. As witnessed recently, higher oil prices have been reengineered without there being a major shift in market fundamentals. ‘Oil shocks’ are not facts of nature; they’re artificially created. In the last decade, the world has witnessed the price of a barrel of oil surpass US$ 150 (in 2008) and plummet to a low of 25 dollars. The crude oil price roller coaster pushes oil companies and even countries to the brink of economic turmoil. However, the question remains as to where the price of oil should be – what is the ‘right price’ for oil? Of course, the high price of oil is not the only issue facing the global economy and economic growth. Having said that, it constitutes one of the primary factors that contributes to instability in the world economy. The Saudi practice is not unusual as oil prices have long been manipulated for specific policy objectives or to gain an upper hand in Middle Eastern geopolitics. Price is a function of supply and demand. The responsibility of Saudi Arabia as the world’s swing producer is to maintain a supply-demand balance. This role has bestowed it with considerable influence in the oil market. Price stability and maintaining reasonable prices lie at the heart of Saudi Arabia’s oil policy. The kingdom’s leadership recognises that rising crude prices could derail a global economic recovery and lead to a steep decline – and that short-run gains from high oil prices may be offset by reduced sales in the future. This form of manipulation can be a double-edged sword. Saudi Arabia has as an interest in not allowing the price of oil to rise too high as it does in not permitting it to fall too low. Over the long term, diversifying the economy away from oil can help cushion the impact of low prices and ensure economic stability in the face of extreme fluctuations. Saudi Arabia has already announced its ‘Vision 2030’ – a plan that will help reduce its dependence on oil and enable the country to regain influence over the global market. This could lead to more stable oil prices.